On most of the recipes I’ve seen, there is a bit of olive oil mixed in to the chickpea flour mixture, I accidentally left that out, but the result was still wonderful. I did purposefully add curry powder, which made it so flavorful, we preferred it without a dipping sauce. Here’s how I ended up making it. 1. 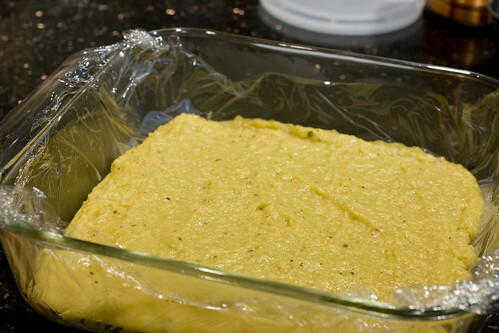 Line an 8×8 pan with plastic wrap. Set aside. In a small bowl, mix together curry powder, 1 teaspoon salt, black pepper, and cayenne. Set aside. 2. Bring water to a boil in a small pot on medium high heat. Whisk in chickpea flour gradually so it doesn’t lump together. Turn heat to low and stir in spice mixture, continuing to stir for 1 minute. 3. Pour into prepared pan and smooth top. Cover loosely and chill overnight, or until it’s a pretty solid block. 4. 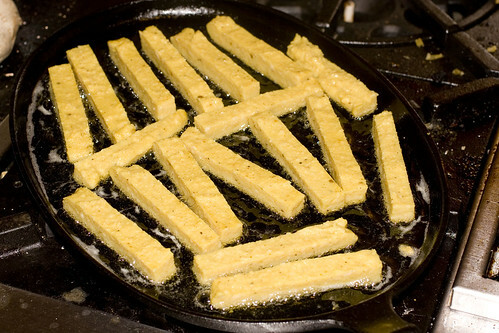 Heat 1/8″ of oil in a shallow pan while you cut the chickpea block into fries: 4″x 1/2″ x 1/2″. 5. Fry all side and remove to a paper towel lined plate. Sprinkle with some more kosher salt and serve immediately. Notes: These take a bit longer to fry than I expected. Be patient and fry one side at a time, only turning when the side you are frying is really golden. Lon absolutely loved these and after eating a bunch plain, decided they were reminiscent of Falafel. Makes sense, so he made a pita sandwich with them. posted by jessica	at 01:36 PM	Filed under Fusion, Recipes, Weekend Shout Out. You can follow any responses to this entry through the RSS 2.0 feed. Both comments and pings are currently closed. is there a baking/broiling alternative to making these fries? would you recommend it? 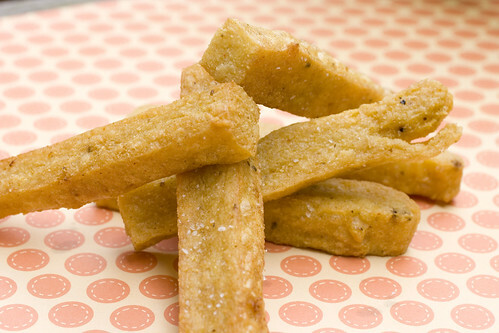 JoJo serves chickpea fries too! Just went there today, but didn’t try the fries though. Glad you liked them! I love the sandwich idea, I am definitely going to try that. That is so funny! I’ve bookmarked the exact same recipe! I just haven’t been able to find chickpea flour hehe. I’m in agreement with Sophia! Luckily, I have organic chickpea flour on hand. Kind of an odd thing to have hidden in your cupboard, but I used to use it in muffins. I’m so glad (and kudos to Sara!) to have something different to use it in. Chickpea flour is used often in Indian cooking. You’ll find it in most Indian stores, like Kalyan mentioned, it’s called Besan. awesome. i’ve seen chickpea flour used more in the last month than in my entire life, and these fries have finally convinced me that i need to try some for myself. This looks perfect for vegetarians and non-vegetarians alike. 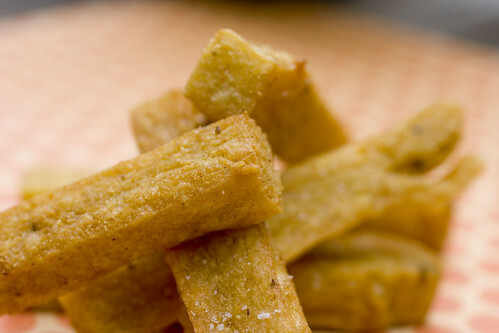 Having never used chickpea flour, this is totally intriguing for us. They look absolutely fabulous!!! I love chickpeas in all of its formes!! The filled bread with it looks just amazing!! Mcchan, hmmm, I’m really not sure. It might not crisp up enough, but let me know if you try it. Sophia and EMC, I’m blushing! Thank you! Kalyan and Manasi, I’m expecting some Indian uses for the chickpea flour pronto! These look great. 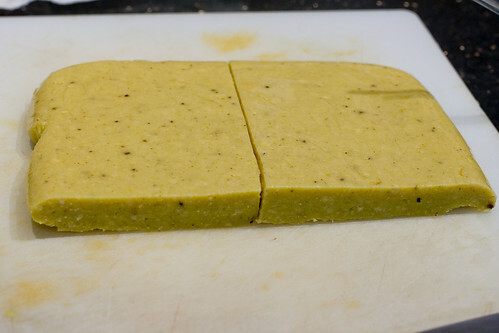 The consistency of the “chickpea block” and the overall process reminds me of fried polenta slices. Chris, they are very similar. 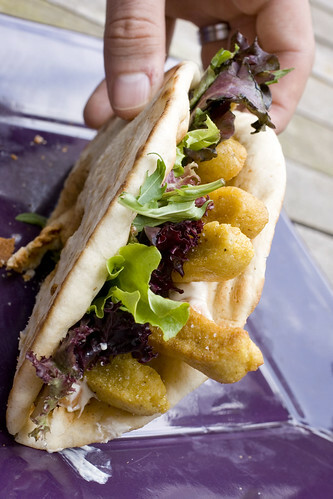 We did a post on Fried Panelle too.